Television is an activity that many families across the United States and world enjoy. Oftentimes, many families will gather around the television to watch their favorite shows, while also checking out news, weather, and sports. This can include local news and sports teams to watching national news and sports that are outside of your local area. There are many television service providers today that can provide your local channels so you can learn what is going on in your local neighborhood, while also providing you with channels that can only be found on basic and even premium cable networks. It is important to compare these various TV service providers, as they can differ in terms of the station packages you can receive and at what prices, as well as the quality of service and customer service, and the reliability of the service they provide to you. The information below will help you to evaluate the many popular TV service providers that are available today so that you can intelligently and thoroughly evaluate your options to determine which of these offers is the best and most financially sound and valuable choice for your household. One of the most popular choices of TV service providers in America today is DIRECTV. This company provides a satellite TV service. It was acquired by AT&T® for $48.5 billion on July 24, 2015, thereby enabling AT&T to add its own Internet service in packaged bundles with DIRECTV’s channel subscription packages. DIRECTV has six main packages of channels for you to choose from. These range from the lowest package of 150+ channels (known as the “Select” package) costing $50 per month for the first 12 months and $90 per month for the second 12 months to their highest package of 325+ channels (known as the “Premier” package) costing $125 per month for the first 12 months and $187 per month for the second 12 months, along with a possible extra $7.29 per month regional sports fee depending upon your market. It is important to note that all DIRECTV packages require you to sign up to a 24-month TV agreement; if you choose to end that agreement before the allotted 24 months, you will be required to pay a $20 per month termination fee for every month that is left on the agreement. There are additional equipment non-return and additional fees as well. Each of the top 4 programming packages includes NFL Sunday Ticket 2017 at no additional cost. DIRECTV provides you with the ability to record your favorite shows and even transfer shows to another television in your house or even to your mobile device via the Genie® HD DVR device. You also have the capability of watching select shows that have aired in the past three days via their 72 Hour Rewind feature or restarting live shows via their Restart feature. Via 2001-2017 ACSI surveys of customers rating their own TV providers performance, DIRECTV has been rated #1 in customer satisfaction over cable for the past 17 years. Another popular TV service provider is AT&T U-verse® TV. Note that U-verse TV is provided by the same company that owns DIRECTV (AT&T), but they are two different TV services because they are based on two separate technologies – DIRECTV is a satellite TV service, while AT&T U-verse TV is an Internet-based service; as a result, don’t presume you will get the same exact channels and packages just because AT&T owns both TV services. With U-verse TV, you can get the same monthly price for two years if you combine U-verse TV with any of AT&T’s telephone and/or other Internet services. All U-verse TV offers require a 12-month agreement; if you break the agreement, you will be charged on a prorated basis for the remaining amount of time, plus equipment non-return fees. When you sign up to a 12-month agreement, you will receive HD service, Total Home DVR®, and up to 3 additional receivers. Once the 12-month period has ended, you will be charged the current monthly rate unless you can cancel before the promo period ends. There is a $35 activation fee to receive U-verse TV unless you order online. You can receive over 234 channels in HD, plus record up to 4 shows via the Total Home DVR, which is included in every package. Select packages enable you to receive the first three months of HBO® and Cinemax® for free. You also have the capability to stream your shows on virtually any device, including your computer, tablet, or mobile phone. The three main packages include U-Family, U200, and U450. U-Family costs $50 per month for 12 months, and you receive over 200 channels. The U200 package costs $70 per month for 12 months and includes over 360 channels and apps. The U450 packages costs $125 per month for 12 months and includes over 550 channels and apps. If you combine your U-verse TV package with AT&T Internet, you can enjoy additional savings and have everything listed on one bill. XFINITY TV, a cable based TV service, is another popular choice for many Americans. This service is provided by Comcast, which is the second-largest pay-TV company after AT&T and the largest cable TV company in the United States. Their five main channel subscription packages are Limited Basic with over 10 channels, Economy with over 100 channels, Starter with over 140 channels, Preferred with over 220 channels, and Premium with over 260 channels. You have the option to add premium channels including HBO, Starz, Showtime, Cinemax, The Movie Channel, and Netflix. With XFINITY’s latest DVR box X1, you can watch your Netflix movies and shows without changing inputs. You can also use the X1 Voice Remote to find any Netflix program you wish to watch, as well as use that voice remote to change channels, search for any show across all networks, and get recommendations on what shows you may like. Utilizing the XFINITY Stream app, you can access any channel in your TV service plan on the go, including on your tablet and mobile phone. This includes getting thousands of On Demand shows and movies, as well as the ability to access your DVR library from anywhere you have an Internet connection. X1 gives you the ability to ensure your children watch age-appropriate content with Kids Zone, including live TV and recordings appropriate for those 12 and under. Additionally, you can filter the content by age group as well, ensuring your children are only watching what you want them to watch. X1 also has accessibility features that ensure everyone can enjoy XFINITY, including a talking guide for the visually impaired, the aforementioned Voice Remote to aid those with vision and/or mobility difficulties, and enhanced closed captioning for those who have hearing difficulties. Another noted TV provider is Verizon. Verizon’s Fios® TV, an Internet-based TV service, gives you the option to choose one of their existing TV subscription packages or create a custom plan of your own based on specific themes. Their existing TV subscription packages include their Preferred HD package of over 255 channels (over 80 in HD) for $74.99 per month for the first year, their Extreme HD package of over 330 channels (over 100 in HD) for $79.99 per month for the first year, and their Ultimate HD package of over 425 channels (over 145 in HD) for $89.99 per month for the first year. Other packages include Fios TV Local with over 15 channels (over 5 in HD) for $10 per month for the first year, Fios TV Mundo (Spanish package) with over 200 channels (over 40 in HD) for $49.99 per month for the first year, and Fios TV Mundo Total (Spanish package) with over 205 channels (over 40 in HD) for $54.99 per month for the first year. When it comes to Verizon Fios’ Custom TV packages, you can choose between Action & Entertainment, Sports & News, Kids & Pop, News & Variety, Infotainment & Drama, Lifestyle & Reality, and Home & Family packages, each of which cost $64.99 per month for the first year. On any package, you can choose to add the five main premium channels – HBO, Showtime, Starz, Cinemax, and Epix. You can choose to add one for $15 extra per month, two for $25 extra per month, three for $30 extra per month, and all five premium channels for $40 extra per month. According to the 2017 American Customer Satisfaction Index, Fios TV ranked #1 in customer ratings for HD picture quality and TV signal reliability. Additionally, every major customer satisfaction study had ranked Fios higher than cable TV providers, including Optimum, Comcast, Cox, and Spectrum. Next television provider to consider is DISH Network. It is an American direct-broadcast satellite provider that provides both local and cable television channels. They offer four main television packages: America’s Top 120 that includes 190 channels for $49.99 per month, America’s Top 120+ that includes over 190 channels for $59.99 per month, America’s Top 200 that includes over 240 channels for $69.99 per month, and America’s Top 250 that includes over 290 channels for $79.99 per month. All packages include a price guarantee for two years, ensuring your rates will not go up immediately after you sign up for a package. DISH Network latest DVR box, the “Hopper 3,” has the ability to locate your remote control if you ever lose it by pressing a button on the Hopper 3 unit, which will cause your remote control to beep and blink so you can find it. It has voice remote capabilities so that you can easily search through the channel guide, recorded programs, On Demand shows, and even Netflix with just one search. It can even utilize Amazon’s Alexa technology to enable you to speak with it and allow it to automatically change channels to whatever you choose. DISH’s Hopper 3 also has AutoHop, which allows you to skip all commercials in select primetime recordings so that you can just watch the content you’ve been waiting to see. In addition, the Hopper 3 has the ability to watch and record up to 16 shows at one time, two times more than the competition allows you to record and watch. In total, you have 2,000 hours of recording space, two times more space than all other competitors. Another popular choice among many Americans is Charter Spectrum®, a cable TV service provider. Charter Spectrum TV, which finished its acquisition of Time Warner Cable in May 2016, enables you to experience more HD channels than all other providers, starting at just $29.99 per month if you bundle other Spectrum services (such as telephone and Internet) with your television subscription package. They are willing to buy out your current subscription to another provider for up to $500 in order for you to switch to them. Spectrum TV Select enables you to get over 125 channels that include free HD, plus enables you to access thousands of On Demand programs, some of which are in HD or 3D. You can stream live TV and On Demand content on your mobile devices using the Spectrum TV app; you can also access your favorite network TV apps. You can also choose to add DVR service on up to four televisions in your home, totaling up to 780 hours of DVR storage. Spectrum TV Select starts at $64.99 per month for the first year. Spectrum’s most valuable packages combine TV, Internet, and phone. They have three main packages. Their Triple Play Select package includes over 125 channels with free HD and free DVR service for $29.99 per month for the first year when bundled together with phone and Internet. Their Triple Play Silver package includes over 175 channels including premium channels Cinemax, HBO, and Showtime, along with free HD and free DVR service for $49.99 per month for the first year when bundled together with phone and Internet. Their Triple Play Gold package includes over 200 channels including premium channels Cinemax, HBO, Showtime, Epix, Starz, and Starz Encore, along with free HD and free DVR service for $69.99 per month for the first year when bundled together with phone and Internet. Another popular choice for Americans is Cox cable TV provider. Cox’s latest cable television package is “Contour.” With Cox Contour, you get an innovative on-screen guide, Smart Search, voice remote control, up to 1,000 hours of DVR storage, and other features. The smarter search enables you to gain instant access to your TV channels, favorite shows, and new entertainment via a search engine that learns who you are and what you like. This is why the search engine also provides recommendations on what to watch based on your personal viewing choices and habits. Cox Contour’s On-Screen TV guide enables you to quickly search two weeks of content on any channel. You can build your own personal library of On Demand movies, favorite TV shows, and more. It also allows you to access the last nine channels you’ve accessed more quickly so you don’t miss a minute of content. You can watch Cox Contour on any TV in your home with whole-home DVR. You have the ability to watch, record, or stream at your convenience. You also have the ability to select thousands of On Demand programs and even binge watch if you choose. Cox TV packages include the aforementioned Contour package that includes over 130 channels of digital cable networks and HD television packages. Their most valuable packages include a bundle of television, Internet, home security, and phone packages. This includes the Cox Bronze Bundle with phone and Internet for $89.99 per month for the first year ($193.47 per month afterwards), including over 220 channels, and the Cox Silver Bundle with phone and Internet for $109.99 per month for the first year ($284.43 per month afterwards), including all Bronze Bundle channels and premium channels Cinemax, HBO, Showtime, and Starz. The Cox Gold Bundle with phone and Internet costs $129.99 for the first year ($306.47 per month afterwards), and includes all Bronze and Silver Bundle channels (including all premium channels), plus Epix. As you can see, you have many different television providers to choose from, including the seven we have gone over in this article. 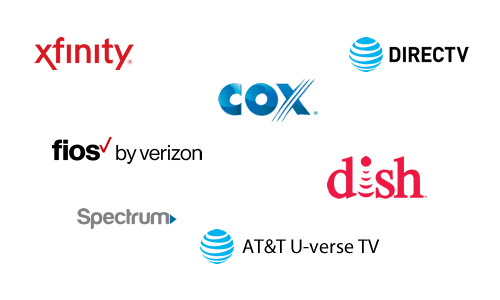 You essentially have the choices of going with a cable TV provider (Comcast XFINITY, Charter Spectrum, Cox) a satellite TV provider (DIRECTV, Dish), or an Internet-based service provider (Verizon Fios, AT&T U-verse TV). Each provider has specific features and channel subscription packages for you to consider and choose from. Virtually all providers now give you the ability to utilize your voice to control your system, as well as the ability to record shows and play them back later from your DVR device. Most providers also give you the ability to watch television from almost any television in your home, and most will also allow you to access your shows and programming via their own custom apps. Due to the intense competition between all of them, most providers will provide you with special deals to get you to sign up, and some will even buy out your previous provider’s contract in an effort to get you to switch. It is best to consider all of the information presented here and on their sites (many useful links below) to truly determine which provider and package will provide the best entertainment value for you and your family. I want to sign into my U-Verse acct to watch tv on my new computer. I can not find the app.